Jestina Lee is an 18-year-old resident of Rockefeller Drive in Palm Coast. Mary Lee is her 80-year-old grandmother. Late Thursday afternoon, Mary Lee called the cops. She told a deputy that at one point that afternoon Jestina had come out of her bedroom, gone to the kitchen, grabbed the glass coffee pot and walked out to the shed in the backyard. Intrigued, Mary lee walked out to see what her granddaughter was doing. When she asked her, Jestina allegedly pushed her grandmother in the upper torso “with two open hands,” according to a police report, causing her to fall backwards over a chair, then onto the ground. Jestina was with her brother, 20-year-old Jerry Lee, who lives at the same house. As Mary Lee got up, the brother and sister were leaving the house. She told the cop that she wanted to file charges for aggravated battery. She declined medical attention. Later that night, at close to midnight, the cop returned to the Rockefeller Drive home, when Lee’s grandchildren had returned there, and read the 18-year-old her Miranda rights. Jestina told the cop that she and her grandmother had gotten into a verbal argument when Mary was trying to get into the shed. But Jestina said she had not pushed her grandmother. Rather, she left when her grandmother said she’d be calling the police. Mary Lee filed for an injunction for protection from both grandchildren, both of whom were served. 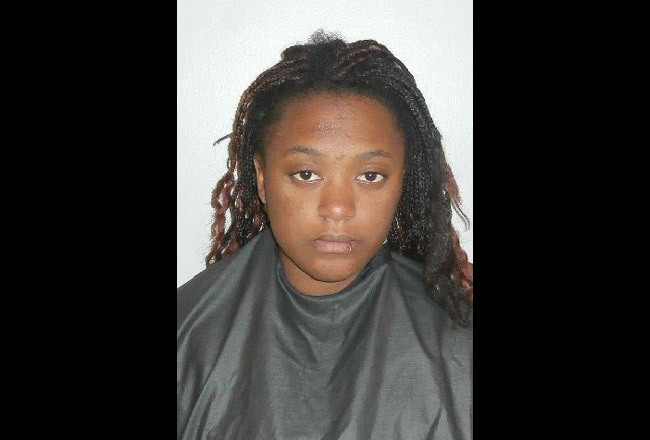 Friday evening, Jestina Lee remained at the Flagler County jail on $1,000 bond. Conviction on an aggravated battery charge on a person over 65 carries a minimum sentence of three years. It’s a first-degree felony (as opposed to a second-degree felony if the person was younger than 65). It is a more serious charge than aggravated battery with a deadly weapon (a second-degree felony). The severity of the charge is puzzling, particularly in light of the cop’s own observation: “I did not observe any marks on her,” he wrote in his report. Aggravated assault on a person 65 or older would be a second-degree felony. No one explained what the glass coffee pot was for? Unfortunately from what I remember growing up in the 80s in NYs crack epidemic glass pots were good for making crack. Not an assumption, just an observation. Wow what a nice way to treat grandma. What’s wrong with today’s youth? Despicable. If she’s willing to do this to her own 80 yr old grandma, what would she do to a stranger that got on her bad side. You need help sister. This whole thing is retarded. I do not appreciate what is being said. I can assure you there is no crack involved. My grandmother has just been really fed up over the last couple months and wants me and my sister to move out. My grandmother is lying. Me and my sister left the house when our grandmother started arguing. She uses wifi down the street to keep tension down in the house so she doesnt usually come home till 10 or 11. I was at a friends house till 11 to have the police show up 30 mins later. My family has its issues just as everybody else does except ish gets real when your grandmother doesnt know how to let simple things go. My sister has been through things that would make a regular person bitter. She has plans to go into the army after graduation and doesnt need anything like this, especially since she did not commit this crime. She is sitting in jail right now over something she didnt even do. This is crazy. She had no scratches or marks or anything of the sort. I disown my family as they have me my sister and my father. If anything this shows how much animosity there is in my family. Im still in shock all of this is actually happening. Can you even imagine an 80 yr old lady falling over a chair and refusing medical attention. @flagler Native, you shouldnt believe everything you read. Todays media is rough and anything that gives a reaction like you just gave will get put out. Wonder if the po-lice checked the shed? Glass coffee pots to make crack? Unless you were cooking amounts that CLEARLY these two couldn’t afford, an ordinary glass would have been better, (preferably one with a thin bottom) That being said, i am glad Grand-ma kicked their buts out instead of making excuses for them like many parents seem to do. Did the coffee pot have coffee it it? That’s a less occupational question. Felony Assaults with no injuries? What kind of Justice System do we have here in Florida? Three years is a lot of punishment for family dysfunction. Lets hope it’s reduced to family counseling. Felony convictions minus one vote? One more for the prison labor force. I hear to about to many of these young adults and kids living with there Grand Parents in Palm Coast.. Where are the parents ?. Isn’t this to much to put a 18 and 22 adult on a elderly lady ? Our mother died when we were very young. Father had a drug problem. This is truly a sad situation. I have known this family since both the kids were little. Jerry is correct his sister has been through alot as he has also. Their grandmother was put in an unfortunate situation by having to raise them as she was already up in age. But because she did not want they going into the system in New York she brought them to live with her. I am in no way excusing any of their actions but to put this young girl away for three years would be wrong as she was already put away and worked her way to get out. Get both the kids as well as the grandmother some serious counseling. I know Ms. Lee loves her grandkids and I am sure she is more than tired of what she has gone through. These are her golden years and no she should not have to live them in fear of children she raised obviously they do not appreciate the sacrifice she made for them. Pray for healing not only with these young adults but all of our young adults & kids here. For you would be surprised how may are troubled, hurting, abused and neglected and will act out in the only manner they know. It’s time for us to stop judging and stand up to take back our kids. No it is not going to be easy but we can do it one child at a time.